Our classes offer a unique blend of traditional yoga practices of mindfulness, physical activity, social skills, games, storytelling, music and creative arts to educate the ‘Whole’ child. They are non-competitive and non-judgemental. We provide a safe and nurturing environment where the children learn to respect themselves, others and the environment. Breathing techniques which help develop self-control, calmness and a connection to their feelings, preparing them for learning. Social skills, games to develop trust, communication, teamwork, compassion and personal strength. Relaxation to reduce stress, develop imagination and positive thoughts, encourage stillness through which they can become aware of their thoughts, emotions and the self. Poses/sequences to release physical and emotional energy, improve physical fitness through building strength and enhanced flexibility. Enhance self confidence, develop a sense of grounding and concentration skills. Healthy living lessons to promote healthy life habits around food, exercise and other life choices. Darsak is the owner of Yoga Dynamix. He trained with Yoga Kids International in 2008 and graduated as a Certified YogaKids Teacher (CYKT) in 2009. 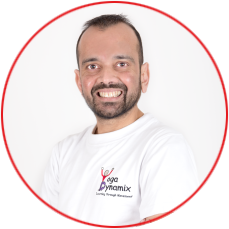 He works with the students on connecting the body, mind and spirit, and through Yoga Dynamix is passionate to make a difference to both adults and children through their own unique yoga journey. Santa has been practicing yoga for many years now and has found that it was a great way to gain energy and calm the mind after a busy day at work. After completing her teacher training with YogaBeez she joined the team at Yoga Dynamix. She loves teaching the children and seeing them develop into young adults. Avni went to India to undergo an intensive yoga training course and has become an Ashtanga Vinyasa qualified yoga teacher. 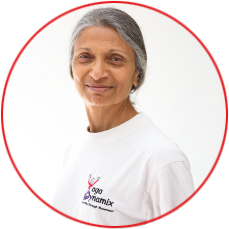 Avni’s real passion has always been working with children so she went on a children’s yoga training course with Rainbow Yoga. Now she shares her experiences with adults, children, family or anyone who will listen in a fun and mindful way. 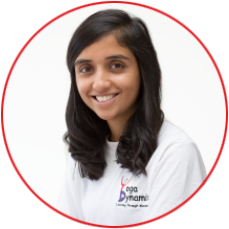 Dev completed her Yoga training with Yogabeez and has been a part of the team in bringing the magic of Yoga into children’s & teenagers lives in a fun and accessible way. She is passionate about sharing what she has learnt and giving them the tools of posture work, breathing, meditation and mindfulness to deal with the pressures they face in today’s frantic world. Nageen is a fully trained mindfulness teacher completing the Mindfulness Based Cognitive Therapy (MBTC) course and the Paws.B teaching course. She is passionate about sharing what she’s learnt and experienced with both children and adults to help them find a little more peace in their lives to be better equipped to deal with the difficulties that it can bring. 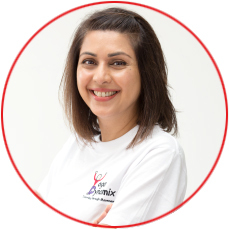 Nageen also works with Mosaic, a Prince’s Trust Charity where she mentors children from underprivileged areas and is part of their Regional Leadership Group. Rohini is an experienced Yoga instructor committed to making a difference by applying a wide knowledge of Yogic Philosophy & Psychology which she has learnt from a very young age in India and continues to add to her knowledge even now. She has trained with YogaBugs and YogAlign and believes Yoga is a healthy lifestyle and a powerful tool for relaxation and happiness for people in their daily life. “Yoga is great as it focusses my mind and helps my body keep fit. 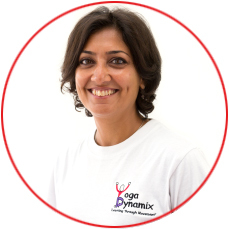 “I like going to Yoga Dynamix because it is a time when I am calm and relaxed. “My journey with YogaDynamix started seven years ago and is incredible! 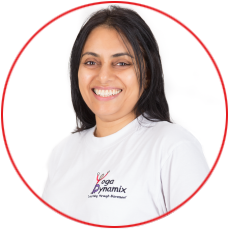 “I have been practicing yoga every Saturday mornings with Yoga Dynamix since they started classes in 2008. Over the years I have learnt to love yoga as I could see the physical and mental benefits of the practice, especially during my GCSSE exams as yoga helped to help my stress levels low. Almost every term the teachers will swap classes which I prefer because that means as a student I get to experience the different styles of yoga that they teach. “I’ve been going to Yoga Dynamix since I was 5 years old and I still really enjoy it. “Yoga helps me to relax and has given me the confidence to make new friends. 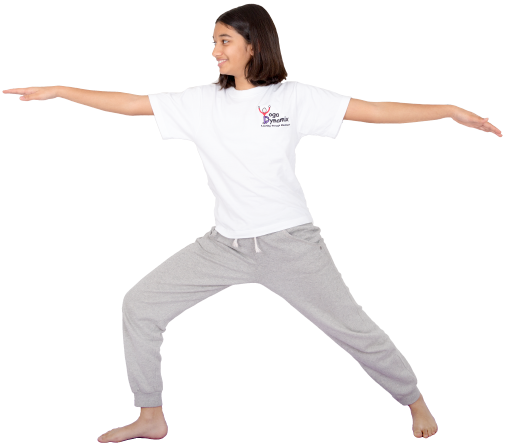 Start your child on a journey to balance the mind and body, through fun children yoga classes.